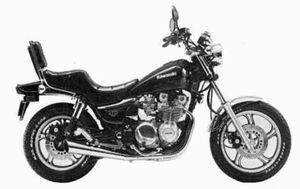 The Kawasaki ZN700A is a motorcycle produced by Kawasaki from 1984 to 1985. 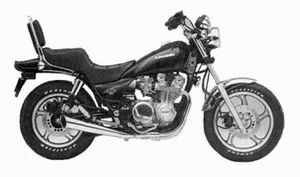 Kawasaki modified the KZ model to create the ZN700 LTD, which squeaks in at 694cc to get just under the 700cc-threshold imposed by the 1980s motorcycle tariff. In 1987, Harley-Davidson petitioned for an early end to the 5-year tariff (tax) and 750 Japanese bikes were back in full force, thus giving the ZN 700 a short production cycle. American sports model with shaft drive. Front dual disc and rear disc brakes, air adjustable front fork, air and damping force adjustable rear shock absorbers. Electric starter and transistorized ignition system. Changes: Color and graphic. Two throttle cables.